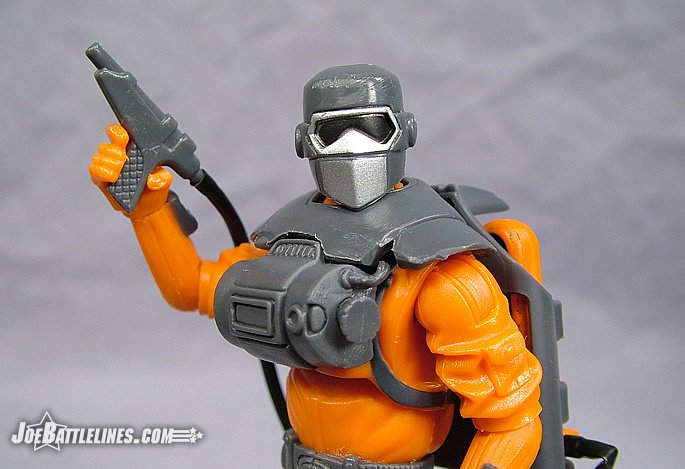 Sometimes I’ve got to come clean when it comes to a particular character in the GIJoe mythos. I’ve NEVER been a fan of Barbecue. In fact, as a young Joe fan I never saw the point of Barbecue. After all, GIJoe was a combat unit so, while members of the team might have fire-fighting training, a full-fledged fire fighter seemed to be ridiculous at best. 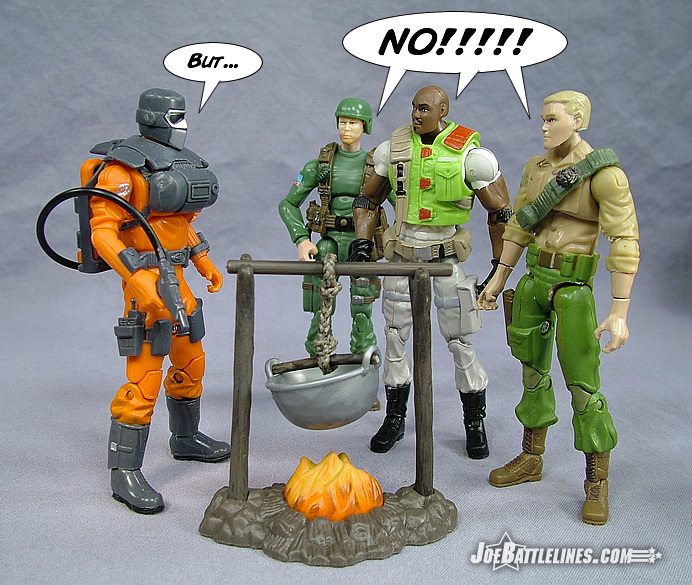 As such, Barbecue was relegated to “base fodder”—stuck on the Flagg, or the TTBT while other characters like Clutch, Gung-Ho, Shipwreck, or Stalker all went off to keep the world safe from the armies of Cobra. Somehow an orange-clad guy with a tank of fire-retardant foam just didn’t seem like the ultimate in “counter-terrorism” to me. When the name “Barbecue” began to be tossed around in conjunction with the 25A style of construction, I assumed this must have been a mistake. 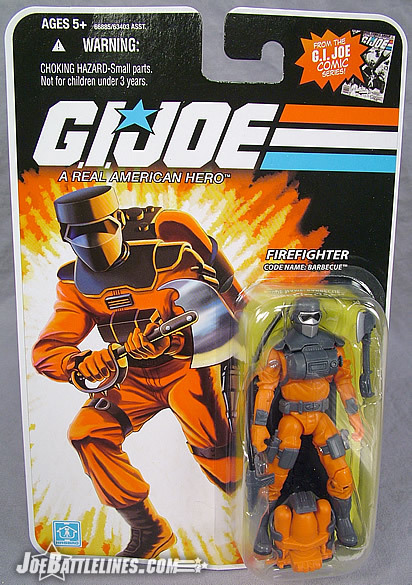 After all, why would Hasbro produce a figure of the Joe team’s ONLY fire fighter when other more prominent characters like Ripcord, Recondo, Dial Tone, or even Airborne weren’t on any of the release lists. Yet, twenty three years after he initially debuted, Barbecue has been re-released in the new “no-ring” style of construction and the results are intriguing. Barbecue’s uniform is deceptively simple. Essentially, the team’s firefighter is clad in a heavy set of coveralls with a gray belt, boots and a heavy gray collar. The new sculpt does an excellent job of capturing this look right down to the molded folds in the cloth and the addition of pads in the knees. The arms might look familiar – and well they should having been used previously on both Snow Job and Wild Weasel. It’s not an immediately obvious parts reuse and it certainly doesn’t detract from the overall design of the figure. In fact, the entire sculpt and parts combination does a pretty solid job of recreating the original character design. It wouldn’t be a 25A-era figure, however, if Hasbro didn’t try and improve upon elements of the original figure and Barbecue is not exception. The original Barbecue always seemed a bit disproportionate to me – mostly due to small collar that set on the figure’s shoulders. The diminutive size of the gray panels made the figure’s head seem larger than really was in comparison. 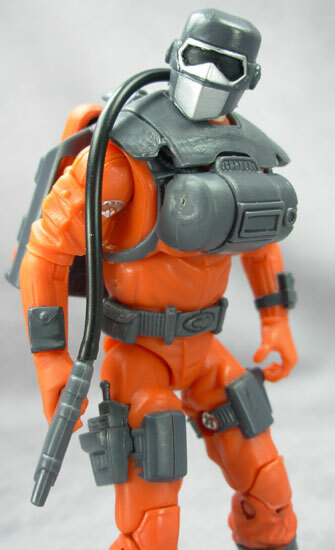 This time around, however, Hasbro gave Specialist Kelly more substantial protection for the neck and shoulders as well as a larger air tank on the figure’s chest. While the unit almost seems a bit too large it serves to give Barbecue a more physically substantial presence. In the end, the design works well to take a classic character concept and bring it forward by twenty-three years. In terms of the 25A era of figures this is one of the more successful updates. In terms of gear, Barbecue’s kit really isn’t all that exciting. He’s got his combination of foam and air tanks on his backpack, a hose and nozzle for the fire retardant material, and a hand axe for ripping through those pesky burning doors. 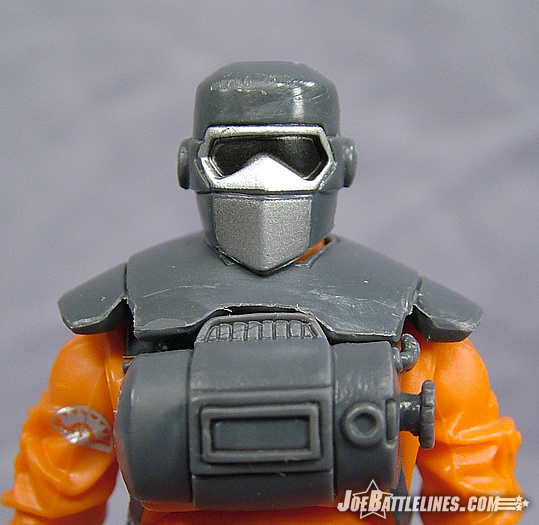 There’s not a lot of offensive capability there but the same held true for the original figure from 1985. If I’ve found anything negative about the included gear it’s the quality of the plastic used to mold the axe. 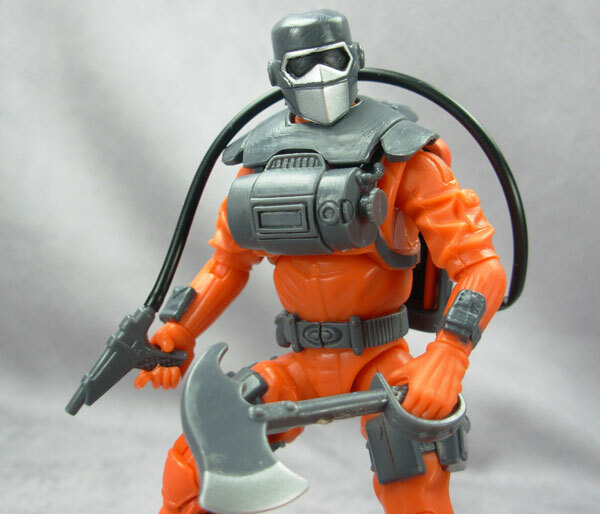 Hasbro (or at least the factory in China) used a softer grade of plastic which ultimately makes positioning the axe in the hands of Barbecue a bit difficult. I’ve tried both the right and left hands and have had the best luck with the right but it’s not just a quick “pop-n-go”. Like many of the 25A era Joes, Gabriel Kelly has difficulty holding the gear he’s been given. (The foam gun doesn’t really fit well in the left hand of the figure I’ve got either.) In some ways I wish that Hasbro wouldn’t adhere quite so literally to the original accessory kit of the figures they’ve produced for this line. Call me crazy but it might be nice to see Barbecue carrying something a bit more substantial than the original foam gun. 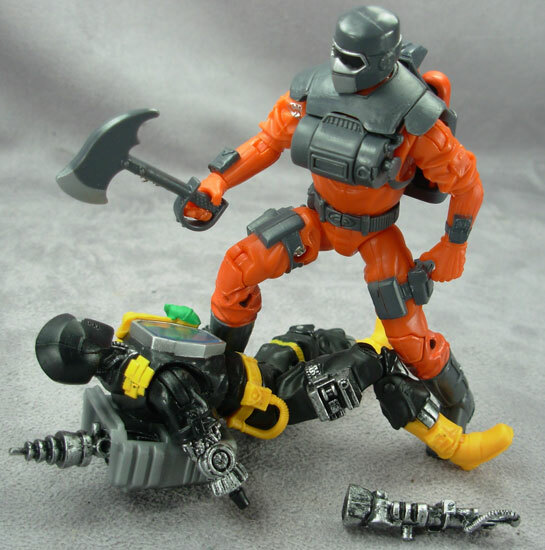 Also, by updating the accessory kit a bit more, Hasbro could have included a small bracket in which to stash the hand axe when not in the figure’s hands. I probably sound a bit “nitpicky” but if people call Justin the “Hasbro cheerleader” then I’m the “Hasbro critic”. It’s funny but with each new 25A figure released I find myself trying to figure out what other figures the crew in Pawtucket can produce with the same parts. In the case of Barbecue’s basic body design, I can see an Airtight and a Ripcord right off of the bat. Perhaps its this concept of potential parts reuse rather that popularity that ultimately determines which figures see release in this new line of figures. Earlier I mentioned that Barbecue seemed an odd inclusion in this wave over other more popular figures who have yet to see release. With the days of this new line dwindling as the release of the movie and it’s related merchandise draws ever closer, perhaps Barbecue isn’t such an odd choice after all. 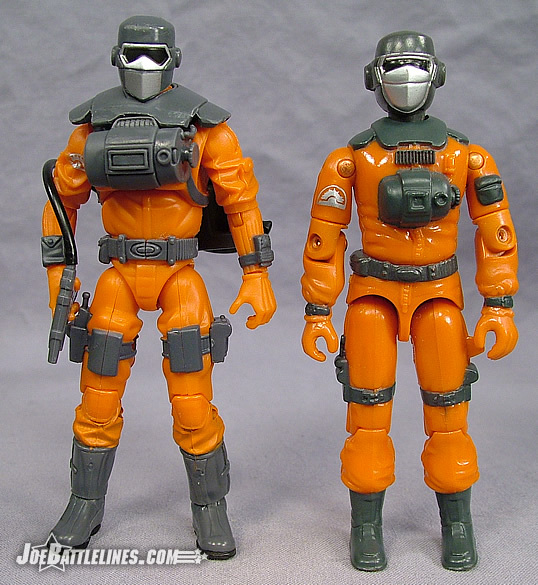 If Hasbro could turn Snow Job into Wild Weasel, or a Viper into a Tele-viper then why couldn’t Barbecue become Airtight or Ripcord or a Toxo-Viper? 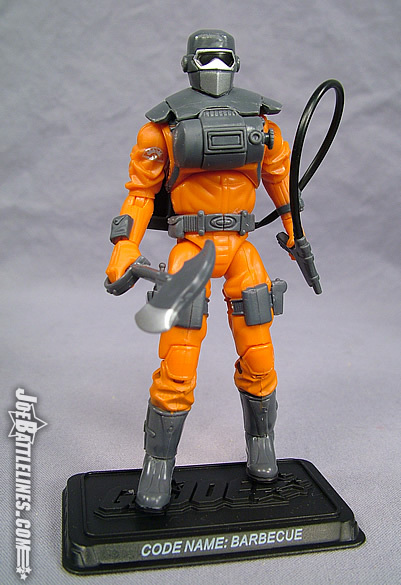 Regardless of the possibilities and my own personal ennui toward the character, I cannot deny that Hasbro did pretty solid job of bringing Gabriel Kelly into the next millennium with this figure release. I’m a bit puzzled as to why the card has him tagged as a “Comic Book” character when the character saw far more use in the Sunbow series but that’s a discussion for the forums. In terms of this new line, Barbecue is one of the better releases in this new line.